Come one, come all, to the greatest show in town! 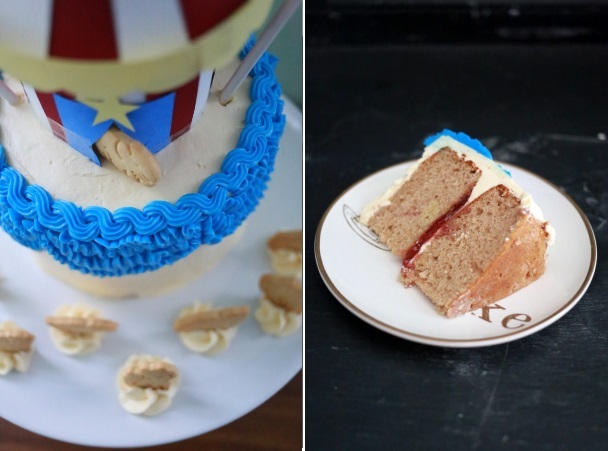 It's the Little Big Top Cake! This little cutie of a confection was made for a wonderful friend's birthday! 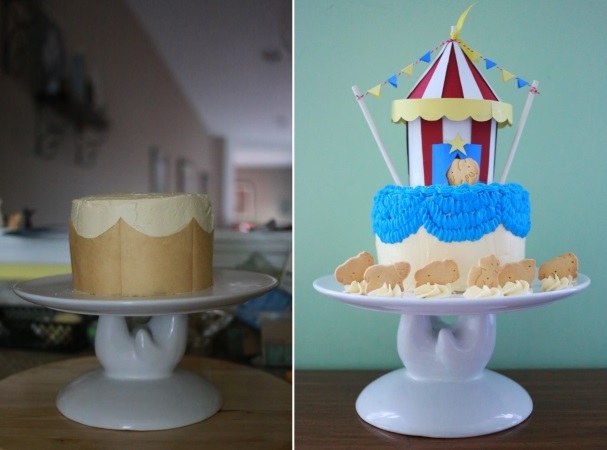 I had a few key elements to start with when planning this cake: 1) she's always loved the circus and dreamed of being in one when she was a kid; and 2) her favorite fruit is raspberries. With a flick of the ol' baker's wand - I came up with this combination! First thing's first. 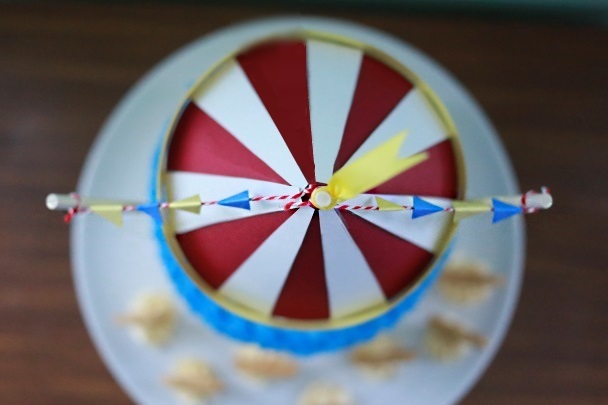 What does a circus cake look like? The premise never deviated very far - stripes, a big top tent, and animals. I debated about decorating the whole thing with fondant but honestly, I cannot stand the store-bought stuff. Making fondant is still on my to-do list. 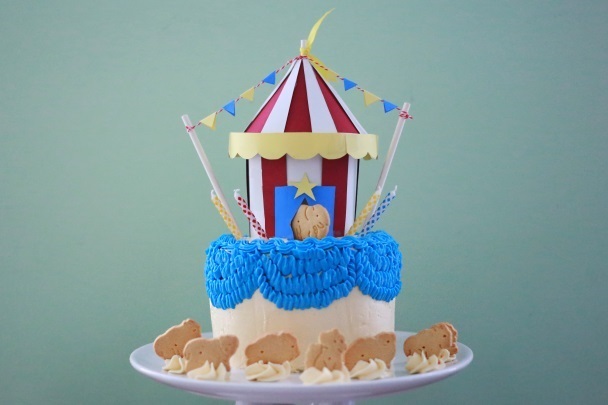 Instead, I found inspiration from a few sites that were selling circus-themed party favors and decided to make a paper-cake topper from scratch. My approach was probably a little more complicated than needed but it still came out pretty good. I was determined to only use things already in my arsenal of decorations.The entire tent was put together with construction paper, tape, a little baker's twine, two lollipop sticks, and a snip of ribbon. In retrospect, I wish I had cut out a little paper banner for the top of the cake that said, "happy birthday." An example can be seen here. For the frosting, I wanted to make a curtain to mimic a grand stage. The inspiration for this idea came from this Vintage Tapestry Cake tutorial. The piping style used on the tutorial is called, "swag borders." A key element for this technique (that I did not take into account) was the base frosting being the same color as the piped frosting. When I piped the blue swags on the white base... it didn't look good. The white background kept peeking through. I should have frosted the base in the same shade of blue for the swag portion of cake to get the full effect. To accommodate, I omitted the swags completely and only piped ruffles using a Wilton 102 tip. I think it preserved the end concept! The rope border (pictured below) was done with a Wilton 18 tip. This style will work with any star tip. Almost every recipe for raspberry cake that I was able to find focused on the raspberry being the filling. 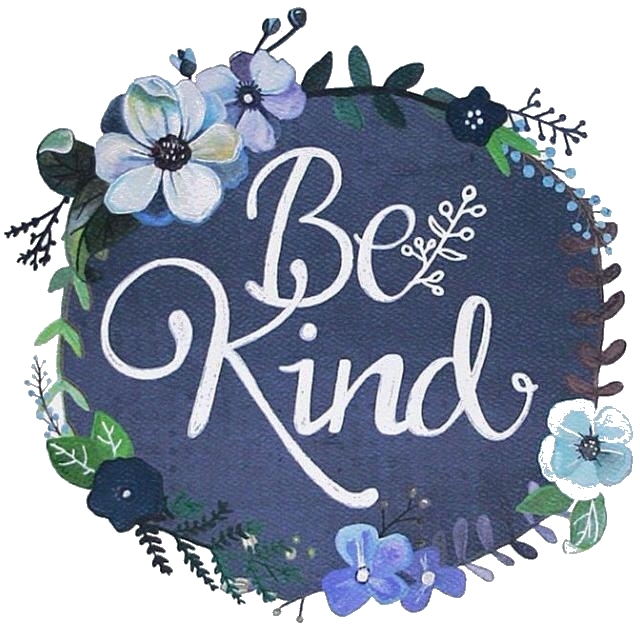 I almost tapped out and accepted this fact -- until I found a recipe for Raspberry and Pinot Noir Cake. It's delightful! The berries and wine are simmered into a magical simple syrup and then added to the cake batter. The fruity-flavor of the wine smooths the tartness of the berries. To take it up a notch, there's also a touch of raspberry extract. I'm not crazy about artificial flavoring but it's such a small amount, I made an exception. Fresh out of the oven, this cake smelled heavenly. 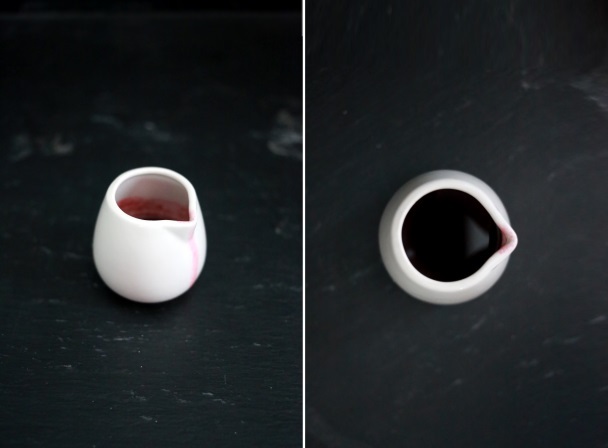 For the filling, I stuck with good ol' raspberry jam. 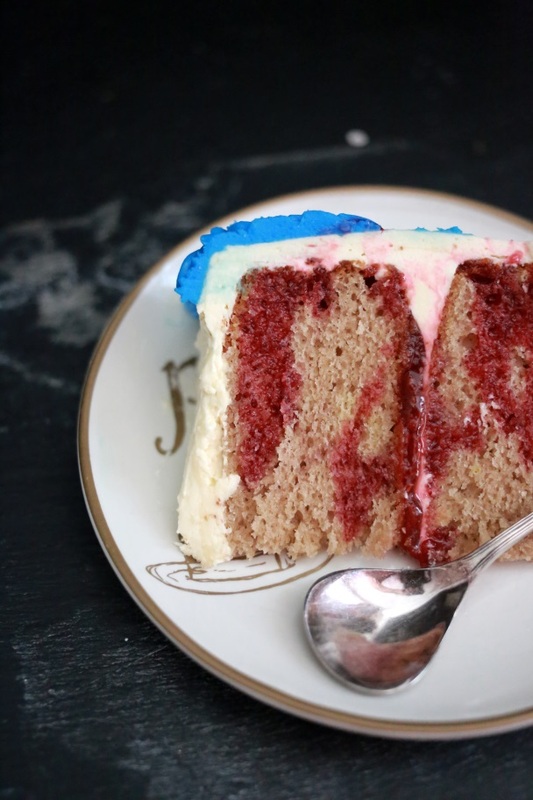 The best part of this cake is the Raspberry and Pinot Noir simple syrup. Oh my goodness, I found it enchanting. There's leftover syrup from the batch used in the cake. You can easily add this to a plain buttercream to create a beautiful and natural shade of pink. You could also add it to chocolate buttercream for a more nuanced frosting! Since I needed the white frosting, I simply drizzled this on slices of cake as we cut them. I was ready to drown my slice in this sucker, as pictured above. Prop up some animal cracker using a rosette of buttercream. 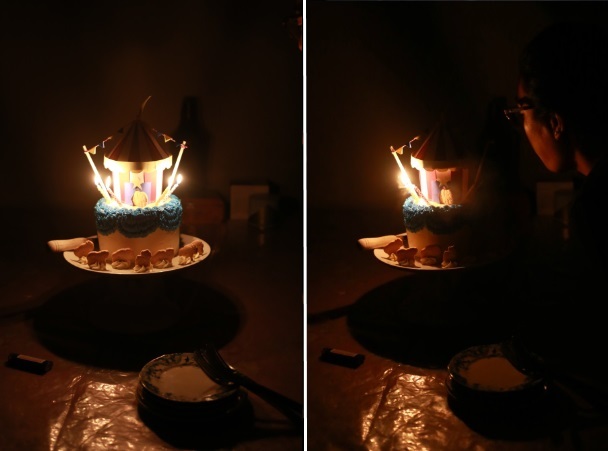 Add candles - carefully pointing AWAY from your combustible cake topper! Alakazam! It's a Little Big Top Cake! Note: I quartered the recipe for 1/4 cup shortening, 1/2lb powdered sugar, 1/2 teaspoon vanilla extract, pinch of salt, and 2 tablespoons of milk.